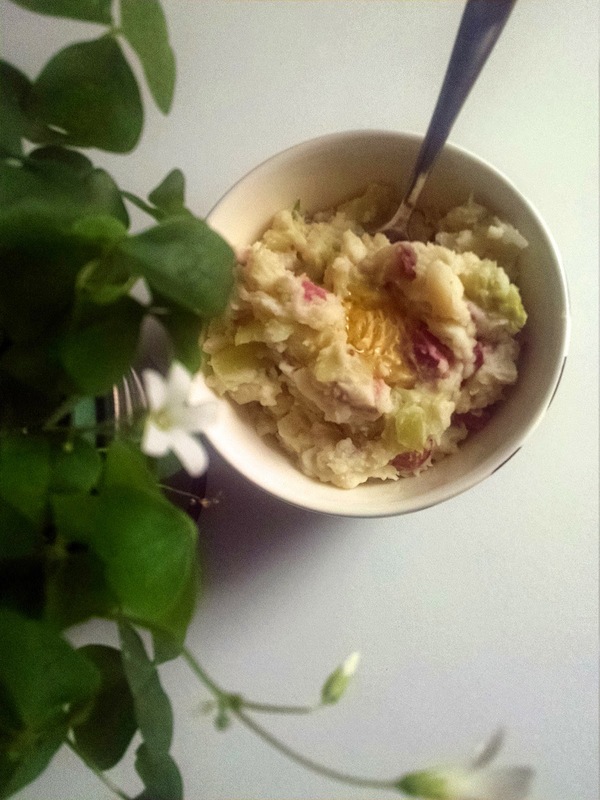 The traditional Irish Colcannon is mashed potatoes with cabbage mixed in. I first heard of it over a decade ago, watching an Irish program on PBS. On the show, a stout redhead in a flowery apron served the host with a steaming bowl of Colcannon on a chilly foggy evening. Hers had ham, in addition to mashed potatoes and cabbage. And a liberal dollop of butter on top. This is my St. Patrick's Day version. This is actually a perfect leftover dish because a typical Irish American family will already have all the ingredients left from a St. Patrick's Day feast. Green onions, diced – optional (only if you already have them. They add a nice springy kick to the dish). *Note on salt: if you prepared the corned beef properly (as in not boiling it to death), it will provide all the salt flavor you need since it retained it during its cooking process. Mix all the ingredients. If the mashed potatoes gone a little dry and lumpy, a bit of cream or even hot water will fluff them back up. Serve colcannon in a bowl. Right before serving, make a little well on the top and drop in a dollop of butter. The heat of colcannon will melt the butter. Stir the butter in right before eating. I suggest using a spoon for this one. Don't forget a pint of Guinness!